Today was the first leisurely day back from our vacation. I had a couple of errands to run and then Ed promised he'd take me to Barnes & Noble. I bought waaay to many clothes for the vacation, clothes I didn't even wear, and I was taking them back. My returns totaled over $150.00 - none of them were really clothes that would have worked in my daily trucking life. After we did that, we went to lunch and then hit the bookstore. It was a picture of Matthew Gray Gubler, who plays Dr. Spencer Reid on the show. I love Dr. Reid's character. He's a genius. A young, handsome, geeky guy with an eidetic memory; he adds a very cerebral element to the show. I always gave my mother grief for being a Law & Order groupie because I just thought it filled her head with too much crap that I don't think ever happens. But I'm a Criminal Minds groupie. Although, since most of Law & Order's stories are "ripped from the headlines", I suppose most of them do have an small element of truth to them. For the longest time, I tried to turn her on to Criminal Minds but she didn't seem interested, claiming she didn't have room for another show in her weekly lineup. But, she eventually caved and started watching. Now she's a huge fan. And she also loves Dr. Reid. According to Wikipedia, Matthew Gray Gubler used to be a fashion model. 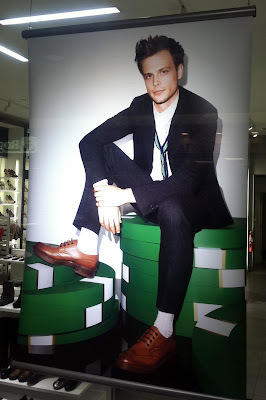 I didn't realize that he still did it, so I was surprised to see him staring back at me through the shoe store window. It sort of made my day. c'mon Salena..that scrawny twerp got nuthin on ED..